It's amazing, that at one time in American History, that it was illegal to own already collected and circulated gold coinage. In 1933, spear-headed by the President Franklin Roosevelt, the US Government did just that; enacting legislation that made it illegal for US Citizens to own US Gold Coins. It was an attempt to bring America out of the depression state and save financial institutions in the US and was backed by a punishment of $10,000 or imprisonment! People panicked, some rushed to relinquish their gold holdings and turned it over to the government to be melted, but many others buried their coins in fear of being punished. Fortunately, such is not the case now and numismatist can freely buy and own gold coins. Like never before, collectors are buying gold coins and bullion, but it still begs the question; How much buried and hidden coins are still to be found? If you have found any hidden coin treasures or want to share a story about a long lost hoard, share it here. 1856-S Small and medium S varieties exist. 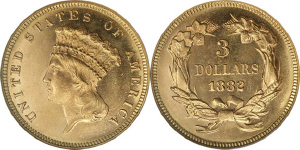 1860-S 2,592 were melted by the Mint. 1865 Rare Restrikes exist of the Proofs. 1868 Varieties show traces of over dating. 1869 Varieties show traces of over dating. 1870-S Only one example has ever appeared on the market. 1873 Open and Closed 3 varieties. 1875 Only Proofs were struck this year. 1876 Only Proofs were struck this year. 1878 Varieties show traces of over dating.